Northwest Preteen Camp is located along the Salmon River in Welches, Oregon, at the base of Mount Hood. Campers and staff enjoying fun activities at Northwest Preteen Camp. We hosted 93 campers and 75 staff, which was a record attendance for us. Our theme this year was the fruit of the Spirit from Galatians 5:22-23 Galatians 5:22-23 22 But the fruit of the Spirit is love, joy, peace, long-suffering, gentleness, goodness, faith, 23 Meekness, temperance: against such there is no law. 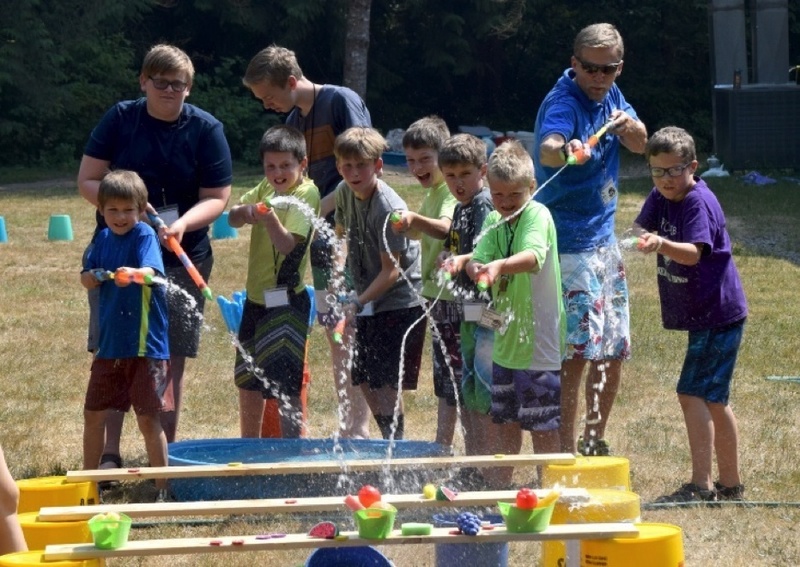 The campers learned the values of the fruit of the Spirit in Christian living class and practiced these values through archery, dance, sports, arts and crafts swimming and a river float. In one Christian living class, the campers were challenged to find words in Scripture to expand on the nine fruits. They wrote them down and placed them on the wall. By the end of camp, they expanded the original nine to 81, filling the wall with positive fruits. The camp owners were so impressed they asked us to leave it there to inspire other guests! For arts and crafts the campers made souvenir picture frames, fruit of the Spirit necklaces, and created cards for those who will not be able to attend the Feast from the region. Archery is a favorite for many and this year there was a spinning target designed to focus your eyes on the bullseye. Campfire is always a hit with clever chants, songs and skits based on the theme. This was a year of firsts and lasts, as Jeff and Lisa Richards worked with John and Sandy Cafourek, who are retiring as directors this year. During the awards ceremony, the Cafoureks were presented with a fruit basket in honor of the theme. They started the Northwest Preteen Camp in 2002 and have directed it every year. Jeff and Lisa were fortunate to have many years working under the Cafoureks as counselors, allowing them to glean the necessary components to direct and serve the campers and staff. We look forward to many more years serving the preteens and their families through the camp program. Jeff Richards serves as pastor for the United Church of God congregations in Bend and Medford, Oregon.